We were greeted by a buoyant and very friendly lady with ginger hair. Her name is Griselda Keiser, she told us, and, continuing a family tradition, she produces a range of fruit brandies in her home distillery, on equipment inherited from her ancestors. 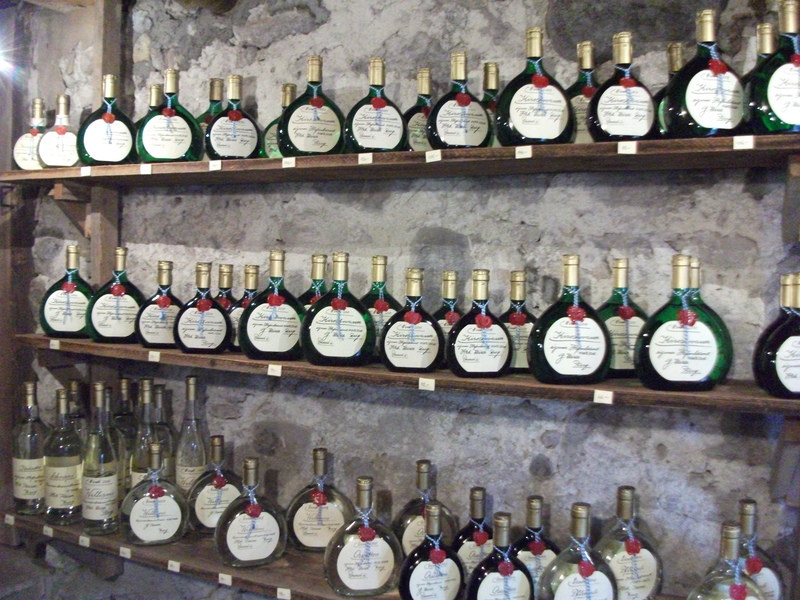 The most famous brandy around Zug is, of course, Kirschwasser, an eau de vie made of cherries. But you shouldn’t think of normal eating cherries, she tells me. 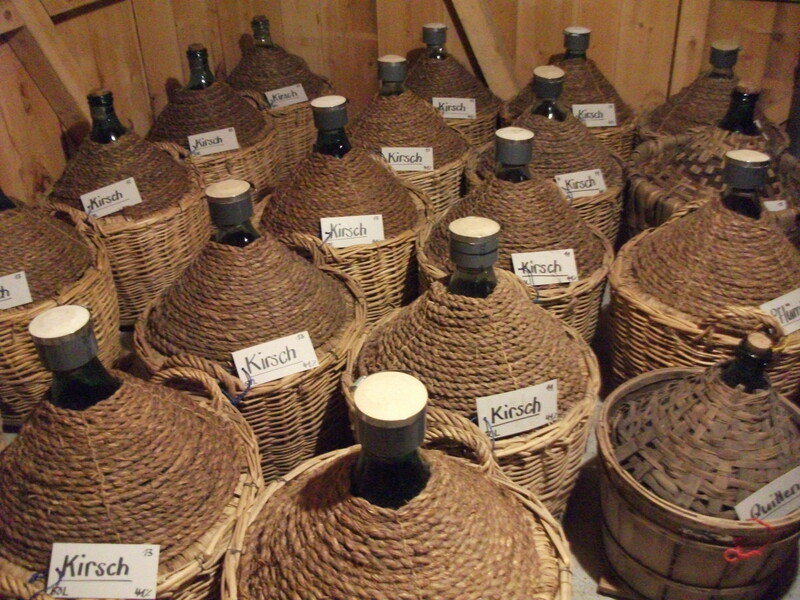 These are smaller, and specially developed for Kirsch-making. But the range of her fruit brandies was much greater: distillates of plums (Pflümli), Mirabelle (a small yellow plum producing the most delicious eau de vie), pear William, quince, and even Kräuter, a traditional liqueur which contains a secret blend of dozens of different herbs. Upon tasting it, the most obvious ingredient was aniseed. Griselda showed us around the property with great enthusiasm. Unfortunately she doesn’t speak much English and my German is not great, either, but I did get the gist of what she was saying. Alas, when she offered us a taste of her different eaux de vie, I didn’t understand what she was saying, and so only ended up tasting the herb liqueur. What a shame. But I had at least become closely acquainted with her 2009 Kirsch, since I have a bottle at home, and it’s the smoothest, gentlest, most delightful drink with a very intense and pure cherry aroma. And yes, Griselda produces vintage distillates. She claims there are perceptible differences between the harvest of each year – and she particularly warmly recommended the 2009. 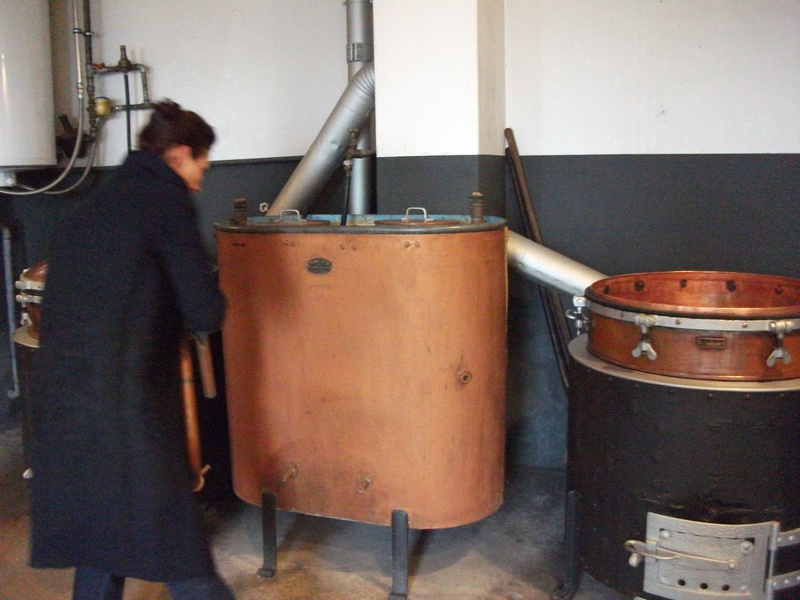 Showing us around the distillery, she explained that the still she uses is over 100 years old and is fuelled with wood. The fruit is hand picked and carefully selected so that only the best goes into the ferment, as blemished fruit will give off-flavours. 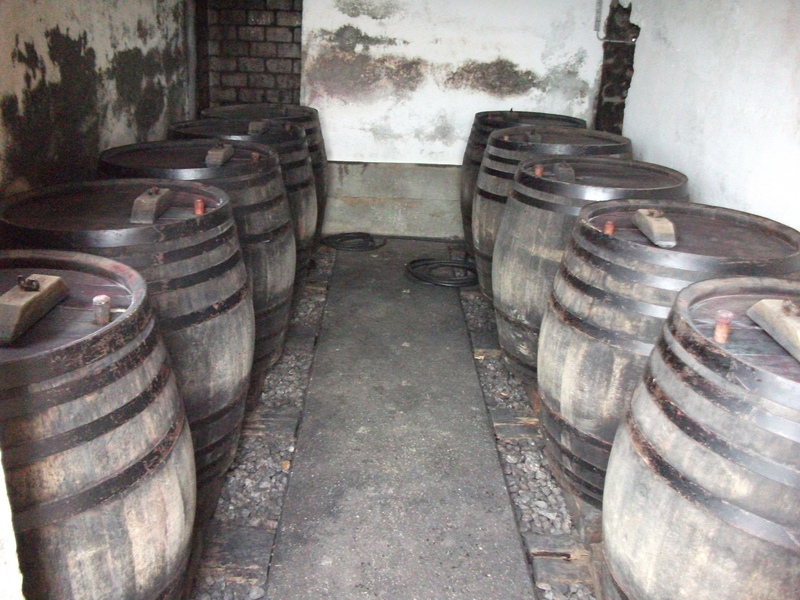 It is then fermented in wooden casks in her cellar over several months (imagine the smell! ), and then in January, when her other business, the sale of flowers, goes quiet, she gets down to the distillation work. Not only the fruit but also the stones go into the pot. These give the spirit an added twist of bitter almonds. Griselda distils twice to ensure purity of the alcohol. It’s a difficult balancing act, distillation. If you distil to a lesser purity, you’re left with richer flavours and texture (this is how traditional fruit distillates, including brandies, are produced). But in some products, for example vodka or gin, you want to achieve the purest alcohol possible, with an almost ethereal texture. 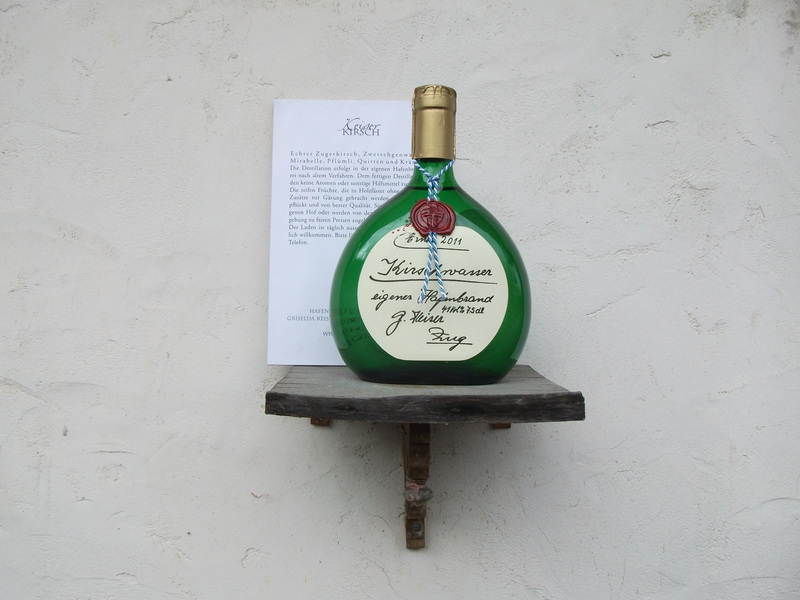 It is the distiller’s decision where on this scale of purity and flavour richness they want their product to stand. What can I tell you – the end product at the Keiser distillery is very convincing! The spirit is then moved to large demijohns (glass carboys), where it matures before being bottled. And if you want to order a gift for someone, Griselda will choose a bottle of your preference and even produce a beautiful, personalized, hand-written label. If you’re ever in Switzerland, do visit the Keiser distillery. 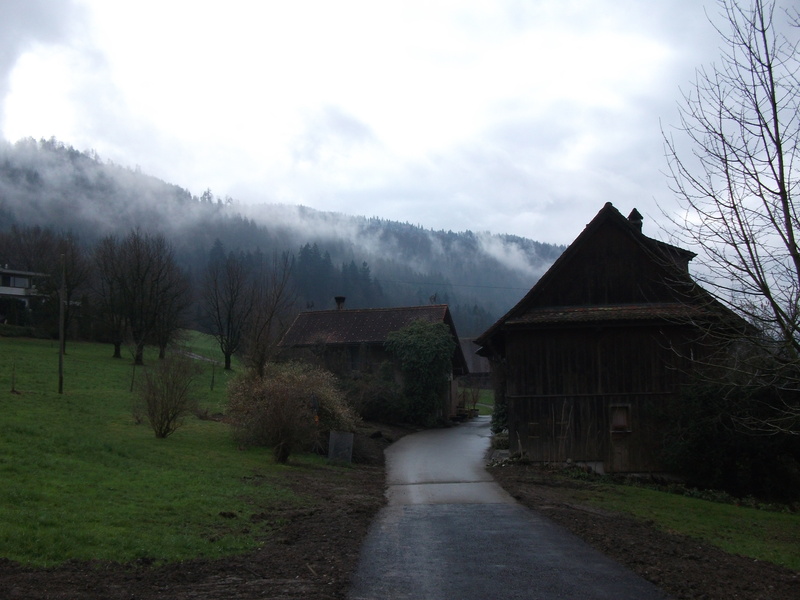 The place is charming, the surroundings stunningly beautiful, the welcome friendly and warm, and the Kirsch amazing!